How many of you have daughters, nieces, or grand-daughters that LOVE lip gloss? My 12 year old thinks it is wonderful. She likes to wear it almost all the time. So, when she knew we were going to work with YoYo Lip Gloss she was excited. I received and L for me and an M for her! 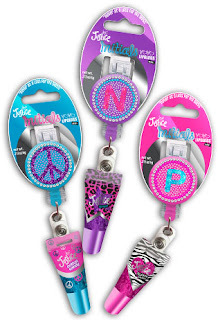 This newest edition of the Justice YoYo lip Gloss is a sparkly, retractable, initial clip. Never at a loss for your lip gloss! This is perfect for my daughter. She can hook it on her belt, purse strap, or backpack and have her lip gloss on hand any time she needs it. Of course that it is hot pink just makes it all the better. Simply pull your lip gloss tube, apply and allow it to retract. These limited edition glosses are only available at Justice Shops and on www.shopjustice.com. 1. The only place in the world you can purchase these FAB glosses is at Justice Shops. 2. Available in 17 different initial letters and a peace sign, 3 different color and flavor variations are available-Cotton Candy (Turquoise), Bubble Gum (light pink), and Grape (purple). 3. Each design is beautifully crystallized with high sparkling glitter initials or peace signs, you can choose from 17 letters or a peace sign design. 4. The lip glosses can be easily clipped on to a belt, pocket, or school bag for quick and easy access. 5. These glosses solve the lost lip gloss dilemma, never search for your lip gloss again. 6. The formula used is a soft, non-sticky formula that is comparable to a high grade prestige lip gloss. 7. Not just a lip gloss, but is also a fashion accessory. 8. You can interchange your YOYOs. Connect your blue gloss to your purple YOYO reel. I make gift packs for kids in need--this would be perfect for a tween girl. This would be for my niece. She'd love it!